"It has never been, nor will it be, Monsanto policy to exercise its patent rights where trace amounts of our patented traits are present in farmers’ fields as a result of inadvertent means. "Due to these aggressive lawsuits and investigations, Monsanto has created an atmosphere of fear in rural America and driven dozens of farmers into bankruptcy. Monsanto has faced considerable criticism from anti-GMO groups and those critical of large-scale agriculture because of its aggressive tactics in protecting the patents on its seeds. Patents have protected seed development since the 1930s with the introduction of hybrid crops, which usually breed truer and thus are worth the higher cost for many farmers. They pay more, but gain higher yields and lower inputs. Since biotech seeds went on sale in 1996, the industry has been particularly aggressive in enforcing those rights, much to the ire of GMO critics. The industry justifies the patent structure, noting that it costs an average of $135 million to develop a new trait and seven years to move it through the regulatory process. There is no documented instance of Monsanto or any other biotech seed company suing a farmer for unknowingly reusing patented seeds. Likewise, there have been on lawsuits over instances where GMO seeds blew onto a farm and germinated. However, Monsanto says it has filed 147 suits against farmers since 1997 (an average of eight per year, while Monsanto has licensing agreements with 325,000 US farmers) who have knowingly violated patent rights by saving seeds for replanting, despite being prohibited from doing so. Monsanto says only nine of those cases have gone to trial, with the company collecting more than $23 million from its targets. Critics, who complain about what they see as overzealous efforts, often portray the defendants in these legal skirmishes as farmers who have no idea how their fields became contaminated with GMO seeds. Monsanto has pledged it would assume the costs of the removal of GMO plants from fields inadvertently cross fertilized (contaminated, according to critics). Among the more popular criticisms aimed at Monsanto is this idea that the company is in the midst of a legal rampage against farmers whose fields contain trace amounts of unlicensed GMO crops. If true, it would be a legitimate fear, considering how easy it is for seeds to migrate (via wind, birds, etc.) from one field to another. The genesis of these claims are traced to an August 1998 Monsanto suit against Percy Schmeiser, a canola grower in Canada. 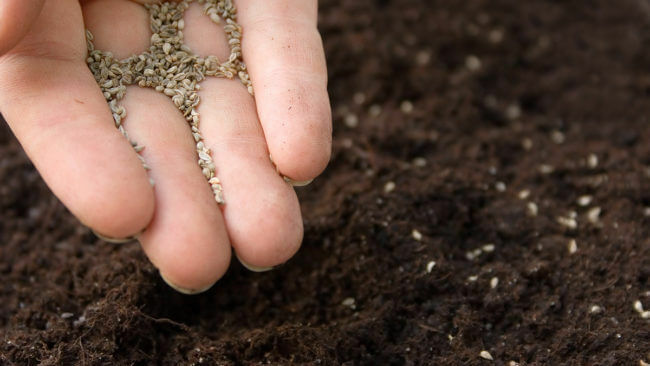 It was a case that helped define the legal rights of companies and their seeds. But the case, and misrepresentations of it, gave birth to the anti-GMO narrative suggesting that Monsanto routinely sues farmers whose fields have been accidentally contaminated with patented seeds. 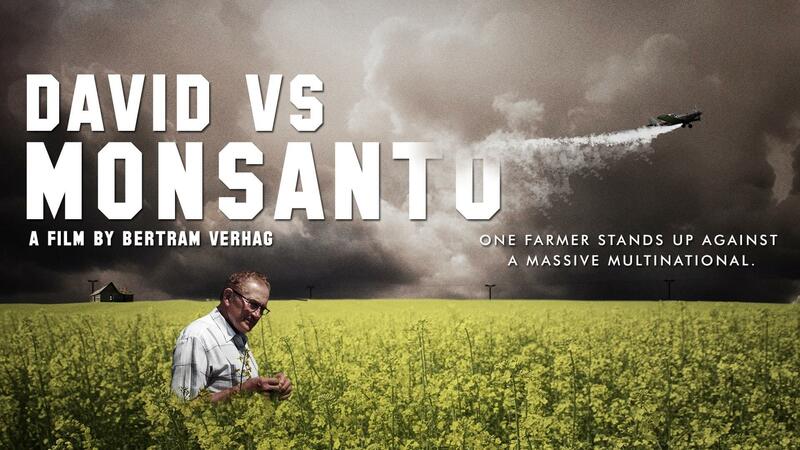 The view was solidified in the 2009 documentary about the case, David versus Monsanto. The affair started in 1997, when Schmeiser was spraying the herbicide Roundup (glyphosate in generic form) around power poles on the edge of his property. He noticed that some of the canola plants weren’t killed by the spray, revealing that they were GMO plants. It’s unclear how they got there—it’s possible they came from neighboring farms or from grain trucks passing on the road. Regardless, Schmeiser sprayed more Roundup in several surrounding acres, isolating a small section of GMO canola. The farmer then saved the seeds from the GMO canola and replanted them in 1998. There is a popular misconception that Monsanto sued farmers for selling its proprietary crops, even though those innocent farmers unknowingly harvested their Roundup-contaminated land. According to the Supreme Court record, however, that was not the case. 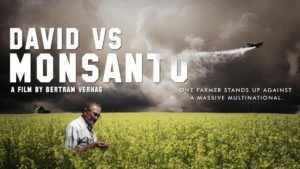 Percy Schmeiser, the main character in David versus Monsanto, went to great lengths to enrich the Roundup Ready canola plants that originated from his neighbor’s land: by treating his crops with Roundup, he ensured that only the resistant strains persisted. In the following seasons, he replanted the seeds without having a licensing agreement with Monsanto. 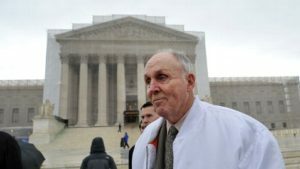 The unusually high prevalence (95-98%) of tolerant plants in Schmeiser’s fields clearly demonstrated infringement in the eyes of the court, and Monsanto claimed rightful remedy for its loss of profit. In the end, the Canadian courts found in favor of Monsanto, ruling that no matter how a patented seed finds its way into a field, that seed is still owned by the company that made it. (Schmeiser testified during trial about his scheme for identifying and hoarding herbicide-resistant seeds that he used for the illegal planting.) But the court rejected Monsanto’s claim of damages, saying Schmeiser did not actually benefit from the planting of Roundup Ready canola because he never sprayed the harvest with the glyphosate herbicide, so he gained no economic benefits from his illegal activity. In the Schmeiser case, of course, such a claim is disingenuous, as more than 90 percent of his acreage was from Roundup-tolerant canola. The Schmeiser case dealt with farmers who plant patented seeds without ever paying a licensing fee. But what about a farmer who pays the fee, and then wants to save seeds from his crop for future use? Bowman bought Monsanto seeds for his main crop. But he also purchased soybeans being sold as animal feed at a local grain elevator. He planted them and sprayed them with Roundup, figuring there would be enough Roundup-Ready beans in the lot to make it worthwhile. He used seeds from the surviving plants for his second, late-season, planting. When Monsanto discovered his tactics and sued, Bowman tried to argue patent exhaustion—claiming that Monsanto’s rights extended only to the first generation of seeds. The Monsanto ruling is not a big surprise but it does send a strong message to farmers, some of whom have likely grumbled over seed patents and limitations on the age-old practice of saving seed. With the Supreme Court’s decision, it’s clear that the current legal system simply won’t tolerate replantings of patented seeds. Instead, the law will support continued efforts by patent holders to monitor what farmers do with patented seed. Replanting of patented seed, whether intentional or accidental, is more than ever a high risk activity. The fact that the US Supreme Court has supported Monsanto’s attempt to take over the world’s food system is a complete disgrace. What about cases in which farmers inadvertently plant GMO seeds — clearly not the situation with Schmeiser and Bowman. 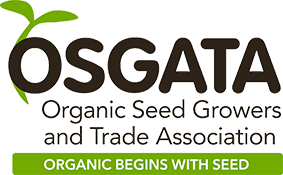 That issue arose in 2011, when Monsanto was sued by the Organic Seed Growers and Trade Association. The plaintiffs included 83 farmers, seed companies, agriculture organizations and public interest groups. They sought a declaratory judgment that would prohibit Monsanto from suing farmers in the future over cases of inadvertent GMO contamination. Their argument was hurt, however, when they couldn’t produce even one case in which a farmer had been sued for accidental contamination. The Supreme Court failed to grasp the extreme predicament family farmers find themselves in. The Court of Appeals agreed our case had merit. However, the safeguards they ordered are insufficient to protect our farms and our families. This high court which gave corporations the ability to patent life forms in 1980, and under Citizens United in 2010 gave corporations the power to buy their way to election victories, has now in 2014 denied farmers the basic right of protecting themselves from the notorious patent bully Monsanto. Monsanto admittedly uses aggressive methods to root out those who buy its seeds on the black market or save seeds from one growing season and use them in the next — a practice known as “brown bagging.” The company hires private investigators (it calls them “auditors”) to dig up evidence on growers it suspects of foul play. It has broadcast the names of violators in radio ads. Monsanto even ran a toll-free telephone line where growers were encouraged to call in and snitch on neighbors. That was in the first few years after the seeds went on sale. Monsanto says those tactics were never widespread and have long since been discontinued. It’s important to note—in direct conflict with activists claims–farmers have numerous choices when purchasing seeds (see here, here, and here). By purchasing seeds from a company, in no way is a farmer locked into a life-long contract: as outlined in this post, farmers can even choose to buy glyphosate (Round-up) from a different vendor when buying Monsanto’s Round-Up Ready seeds since the herbicide is off patent. Farmers can choose whichever seeds they’d like, from whatever company they prefer, be they GMO or not, patented or not. It’s also important to note that few farmers in industrialized farm countries want to reuse their seeds, even if they are not under licensing agreements, and that includes most large-scale organic farmers. The truest growing seeds are often sold as hybrids, which have the “best” of the traits that breeders are looking for. However, once these plants grow and produce seeds of their own, it is unlikely that the latter generations will have all the beneficial traits present. On the other hand, saved seeds often result in reduced yields, increased susceptibility to disease—and farmers even risk an increase in crop failure. And this is not because of Monsanto, GMOs or patent law. 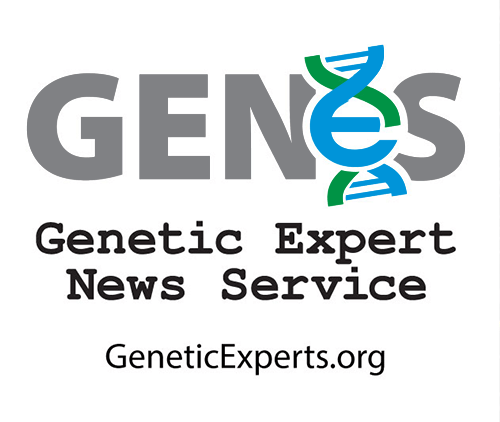 Why are GMO seeds patented?